Wear the great slogan of the hacktivist movement #OccupyWebspace along with web address SANGKRIT.net as the chanting chestline on your T-shirt that you yourself get printed. 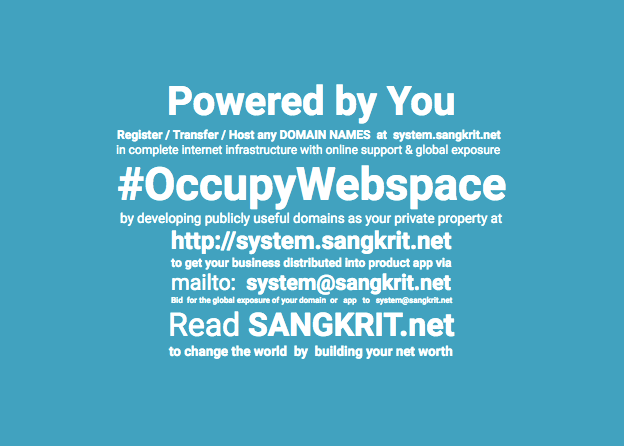 Signup for your free SANGKRIT.net account and read #OccupyWebspace on your android phone from Play Store to earn respect as the people’s personal outlet by providing complete internet infrastructure, online support and global exposure to everyone everywhere. Thus you establish actual leadership through the internet age in cooperation with others like you. Bringing everyone’s business online is the biggest business going on, which becomes easy to startup and even easier to shut down because of monthly/annual payment options available at http://system.sangkrit.net, making it individually optional and easiest upon everyone involved so you may most easily startup individually into internet industry to independently expand also that easily with online support from system@sangkrit.net without entrapping yourself anywhere or anyone into a wage slavery. Wear the great slogan of the hacktivist movement #OccupyWebspace along with web address SANGKRIT.net as the chanting chestline on your T-shirt that you yourself get printed. Backcover of your android phone is another place of putting your signboard so that appropriate people may approach you anywhere. You grow as a smart creative readily available indeed to anyone in need. Doing that you engage others as well in the business of upgrading humanity as per the standards of the smartphone stage of internet age. Exactly you let others also become the people’s personal outlets. You do so to let them work for themselves by working for humankind in complete cooperation with each-other under your leadership of affluence. Following human technology people’s personal outlets (such as yours) as the building blocks of Sangkrit, learn building business in complete cooperation by awarding fellowships among themselves for innovation and promotion, excelling with each-other only in upgrading humankind into internet age. Once your group of people’s personal outlets registers 100,000 domains altogether, you earn your personal app free to lead globally thereafter. The same goes for everyone involved. So that everybody works together and grows together.